So I must confess, I am a recipe blog junky. I try to limit my time on the computer being as I’m on here so much for blogging, but if I’m not editing photos or blogging, I’m most likely stocking my favorite food blogs. If you don’t believe me, you should see my Pinterest account. 99.99% of my pins revolve around food, and is where I first saw this amazing recipe. Recipe Girl is one of the blogs that I peek in on from time to time, and secretly aspire to be like. I mean seriously, just the imagination to think up this decadent breakfast is amazing. And I have to say, these beautiful pancakes are just that, completely amazing!! And they are really much easier then you would think. I was actually surprised by how easy they were. Probably only takes about 5 extra minutes then it would take making normal pancakes. Not to mention, they do taste almost exactly like a cinnamon roll. I did change the cream cheese glaze just a little. If you see in the pictures of me preparing the frosting, the end product came out kind of brownish looking. So I ended up adding some more powdered sugar and a little milk to bring the color back to a pretty white, but you can also easily avoid having to do this by using imitation vanilla extract which is clear and wont discolor your glaze. That is only if you are as picky as me by how your food appears though. Just one last picture to portray how amazing these are. Doesn’t it just make you want to take a bite!! Seriously, no better way to begin the day 😉 Enjoy!! 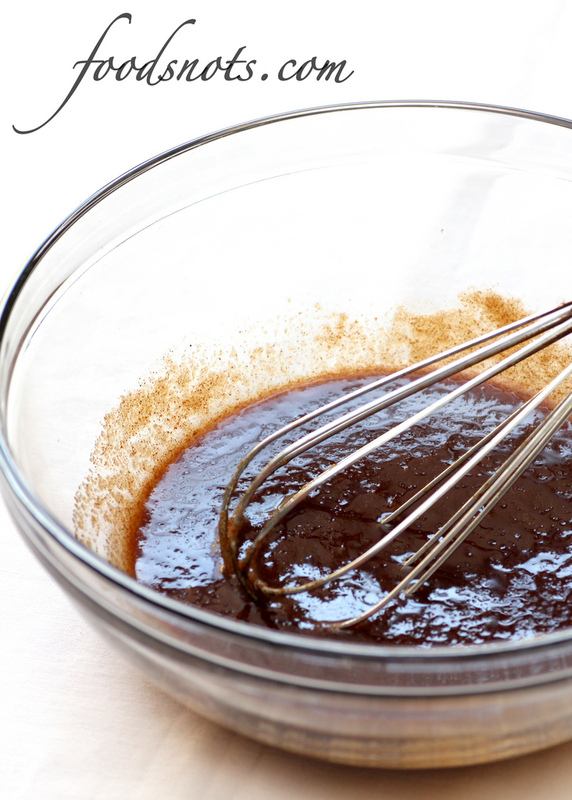 In a medium bowl, stir together the butter, brown sugar, and cinnamon. Scoop the filling into a quart-sized heavy zip baggie and set it aside. In a small pan, heat the butter over low heat until melted. 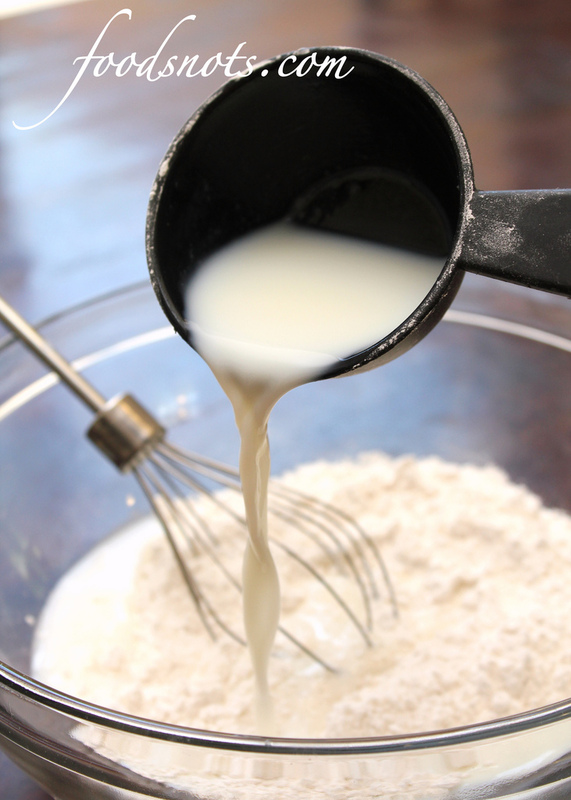 Turn off the heat and whisk in the cream cheese until it is almost smooth. Sift the powdered sugar into the pan, stir and add in vanilla extract. Set the pan aside while you make the pancakes. Cook the pancakes: Heat a large, nonstick skillet over medium-heat and spray with nonstick spray. Use an ice cream scoop (or I used a 1/4 cup measuring cup) to add the batter to the pan. Use the bottom of the scoop or cup to spread the batter into a circle about 4-inches in diameter (I did not have to do this because my batter was thin enough to spread out by itself). Reduce the heat to medium low. Snip the corner of your baggie of cinnamon filling and squeeze the filling into the open corner (you may need to knead the cinnamon filling before clipping the bag, as the filling tends to separate a little). When your pancake begins to form bubbles, add the filling. 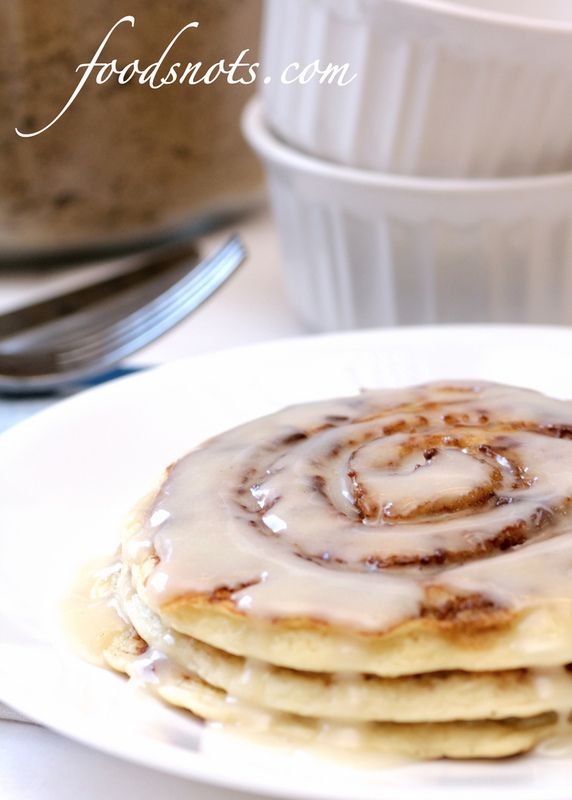 Starting at the center of the pancake, squeeze the filling on top of the pancake batter in a swirl, just as you see in a regular cinnamon roll (be careful not to get the filling to close to the side. You want to keep it about a 1/4 of an inch away from the edge or it will bleed over). Cook the pancake 2 to 3 minutes, or until the bubbles begin popping on top of the pancake and it’s golden brown on the bottom. 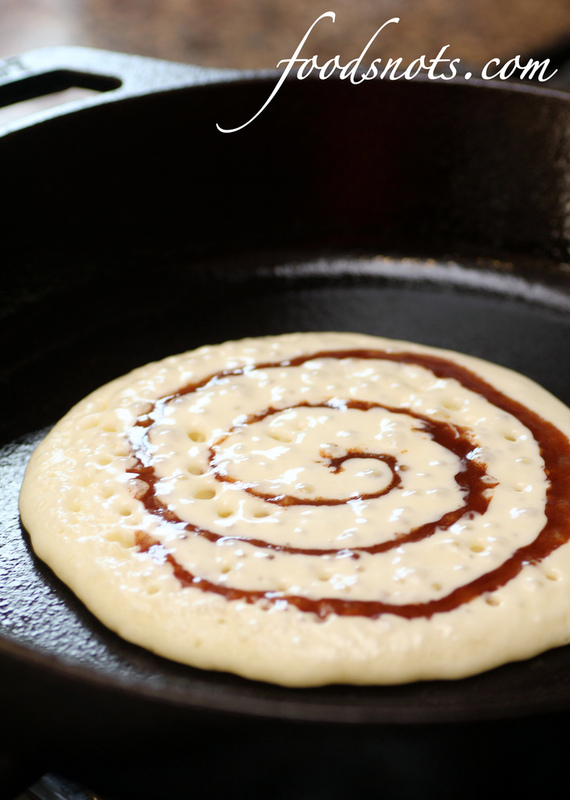 Slide a thin, wide metal spatula underneath the pancake and gently but quickly flip it over. Cook an additional 2 to 3 minutes, until the other side is golden as well. « Sirloin and Summer-Vegetable Kebabs with Gorgonzola Port Sauce » Whiskey Refried Beans & A Giveaway!! !